It used to be that the Liberals were the ones with the loud obnoxious rants.... now there is a new generation of older idiots to contend with. This guy talks as if he is using truth or logic, but none of the information gets backed up by any facts. It's one long rant - and not even a convincing one at that. If the Conservative movement ever wants to regain some sort of legitimacy or momentum, they'll need to distance themselves from this kind of ranting. It doesn't make an argument - just provokes a sort of mind-numbing, million mile stare and a tinge of disbelief that anyone could be so popular by being so ill-informed and inarticulate. If you enjoy pain and anxiety - by all means, give Beck a try! Wow, so his arguments in the overview are all supported by the "ad hominem" and "strawman" fallacies - neither of which create valid arguments and are only used to solicit an emotional response. If the entire book is like this then what is the point of reading this? He has shown just from his description that the book has no substance and is full of "scare tactics." Why would you waste your time and money on this insane man. Very opinionated and I'm not convinced by the facts given. I found the narrator irritating and condescending. Good book with good content however if the preview says narrated by Glenn Beck then the whole book should be narrated by Glenn Beck not his assistants. Excellent book. Glenn Beck does his homework here. I couldn't pull myself away. 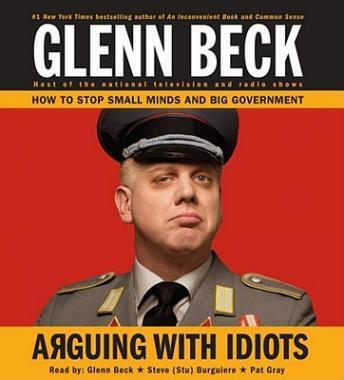 Glen Beck is very funny but the thing about this book is just what it says in the description, The way to win arguments is to know the facts. This is what makes him so hated by the left, he is funny and he keeps bringing up facts that they would rather keep under the radar. I didn't like this book quite as much as An Inconvenient Book but it is a close call. If you are an unrepentant liberal you probably won't like this book, but if your mind is slightly open give Beck a try. Not as good as common sense. To much information on subjects. " Please just the facts"